The majority of us aren’t born with full, shapely, defined brows (unfortunate, but true). So we spend a great deal of our time powdering, brushing, filling and blending what we do have to create a more desirable shape and depth. But what if we told you didn’t have to do that every morning before work and every evening before you head out? You’d want to know more, right? Well prepare to be amazed! There’s an option for those of you willing to try something a little different: tinting your brows with henna! You’ve probably seen the intricate and beautiful henna designs that adorn the hands and feet of brides practicing the tradition or (increasingly) as an option for semi-permanent ‘tattoos’. What you might not have known is that the same dye can be used for cosmetic purposes. Henna can be used to add color to your hair – and that includes your eyebrows. What’s even better? You can do that from the comfort of your own home with a DIY Eyebrow Henna Tint. But before you go mixing your own henna paste, you eager beaver, let’s learn a bit about what henna is and how it can benefit your brows. Henna is a dye that is derived from the Lawsonia Inermis plant (aka: Hina, the henna tree, the mignonette tree or the Egyptian privent). The plant contains a naturally occurring substance called lawsone, which is an active coloring pigment. Traditionally used for temporary body art on the skin and hair as well as for dying fabrics like silk, wool and leather, henna has made its way from Asia and Africa to both Europe and North America in the last few decades. Lawsone is contained in the leaves of the henna plant and it is possible to create a stain by mashing the leaves into a paste: lawsone binds with the proteins on the outer layer of your dermis to create a fast but semi-permanent stain. Working with crushed leaves isn’t exactly ideal so henna leaves are more commonly dried, milled and sifted into powder form. The powder is then mixed with a liquid in order to form a paste. Possible liquids include: lemon juice, water or strong tea. Some henna artists will also add sugar or molasses to their paste to help it stick to the skin and make it easier to work with. After the henna has been mixed, it is left to sit for anywhere from 1 to 48 hours, to allow the lawsone from the leaf to combine with the liquid ingredients. Once applied, you can achieve a light stain by applying the henna paste and removing it within a few minutes. For longer-lasting stain, like what you’ll want for your brows, the henna paste must be left on the hair or skin for as long as possible and allowed to gradually flake off on its own accord. Henna stains appear orange when the paste has been removed but this will darken over the course of 1 to 3 days, turning to a deep, reddish-brown hue. On your skin, henna will hold for a few days and then fade as your skin naturally exfoliates and sheds skin cells. But on your hair, henna can last anywhere form 2 to 4 weeks! WHY USE HENNA TO TINT YOUR EYEBROWS? Have you ever tried dying your eyebrows with boxed dye? It’s messy, to say the least. Henna, on the other hand, is considered to be a safe and more natural alternative to dying that has less clean up. Henna can range from orange to auburn to burgundy, so it offers a good selection of colours and will change depending on the original colour of your hair. Though henna can be mixed with hair dyes to offer more variance on hues and shades, it is more-often-than-not mixed with natural stains like Cassia obovate (to achieve lighter shades of red and blonde), or with Indigo (to achieve browns and blacks). How’s that for adaptability? Finally, henna is close to impossible to remove except through the exfoliation of your skin and its natural tendency to fade. So, if you do your eyebrows every single day and you’re getting tired of all of that work, perhaps this semi-permanent stain is your answer to better brows. HOW LONG DO HENNA TINTS LAST? Using henna to tint your brows will take some dedication, but not as much as your makeup routine. 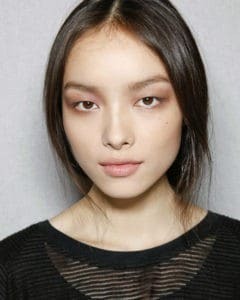 Eyebrows have a rapid growth and shed cycle, but it’s still lower maintenance than filling in your brows on the daily. You’ll likely have to apply henna from once every two weeks to once a month, depending on your body’s schedule (and no, you can’t control that). Keep in mind that the first time you use henna on your brows it may appear orange (especially with just pure henna), but a repeat application can be done to deepen the colour when and if needed. Plus, you only need about one tablespoon of henna powder mized with your choice of liquid to get your brows completely covered. 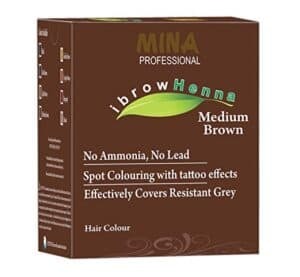 Free of toxic chemicals (like Amonea and Lead) and safe for use on all skin types, MINA’s eyebrow henna kits include 12 sachets (applications) and are considered some of the best as well as most effective. With long-lasting wear for up to six weeks and available in 8 colors (inclusive of blonde and dark brown) and MINA offers kits as well as refills, cleansers and oils that are best suited to eyebrows treated with henna stain. 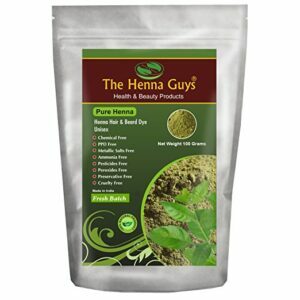 It doesn’t get any more raw than this henna powder that’s all natural, vegan and pesticide-free. This 100 gram package will last you for months on end and can be mixed with your choice of liquid to form a paste that you can trust for application on your most prized attribute: aka, your beautiful brows. If you’re going to use pure henna on to tint your eyebrows, we’ve included some basic guidelines below. Mix henna powder with lemon juice in small glass bowl to form a paste. Ensure paste has a thick consistency with no air bubbles or lumps. Cover the bowl with a lid and leave it overnight to allow lawsone to activate. If you’re in a rush, you can leave it for as little as one hour, but this stain may not have the long-last or depth-of-colour you desire. The following day, wipe makeup and dirt from your brows with an alcohol. After a few minutes, apply shea butter or petroleum jelly around your eyebrows so that the stain doesn’t go into unwanted areas. Apply henna mixture to your eyebrows using a mascara brush or cotton swap. Cover the area with plastic wrap and let it sit for 20 minutes or until it begins to flake naturally. The longer you wait, the more deep your stain will be. To help your stain last longer, apply a mixture of sugar and lemon juice to the dried henna paste. This will release more dye from the paste and make your colour more intense. Your best bet when tinting your brows with henna is to avoid going out for a couple of days. Avoiding the sun and free radicals will protect the stain and colour (especially if you’re a first-timer). You should also avoid washing the area for at least 12 hours and never use a harsh cleaner or exfoliator after hennaing. You can also protect and moisturize with shea butter or coconut butter. WHAT YOU NEED TO KNOW BEFORE PURCHASING HENNA? Most people don’t experience any negative side effects when using pure, natural henna although some users do report allergic reactions. Test the henna on a small portion of your skin before applying it to your eyebrows so you’ll know what to expect ahead of time. Be on the lookout for pre-mixed henna body art. These products may be mixed with risky ingredients that darken the stain or alter the stain color but can cause serious skin reactions, including: redness, blisters, lesions, loss of pigment, sun sensitivity and scarring. Although it may not be relevant to most people’s eyebrows, brightly colored henna in blues, greens, yellows or purples definitely contain ingredients intended to alter their color and should be avoided. Remember that true henna is orange, red or brown in color. A lot of work goes into achieving the perfectly shaped and defined eyebrow… And we mean a lot of time-consuming, makeup-using, work. If you’re not one to leave your house without your brows on point, using henna to give you a deep tint might help lessen your already-full load. It’s a safe, natural and adaptable alternative that’s worth a try!